Amidst all the EDC planning and preparations Insomniac Events has found time to revamp their website into a wealth of knowledge for EDM fans everywhere. The new and improved Insomniac.com creates a complete online experience loaded with exclusive interviews, editorials, regular columns, videos, downloads, DJ mixes, live events, new releases, looks into cultural trends and emerging local scenes, as well as two Insomniac original series. Several exclusive interviews with Martin Garrix, Afrojack, GTA, Krewella and Getting “Ratchet” with Borgore. Current EDM trends articles like How to Talk to Your Kids about Hardstyle which discusses the genres rapid growth in America. #EDCAuditions – An American Idol-style web series following Insomniac Event’s search for their one-of-a-kind festival performers. On The Road to EDC – Another Insomniac Original web series which follows YouTube stars Cupquake, Red, Mr. Sark and Evelina as they take an inside look into everything that makes festivals like EDC Mexico and EDC New York unique. Exclusive music and playlists including Insomniac Editorial Team’s “Work & Playlist: The Essential Office Mix” loaded with their favorite tracks. Editorials created specifically to include fans into the experience such as Sound Advice: Markus Schulz where Markus answered Headliner’s questions regarding love, life, and EDM in general. Numerous articles aimed to further expand your knowledge of the EDM world. 10 Things: New-School Ravers vs. Old-School Ravers highlights a few facts any new raver would benefit from. The Insomniac Store is back on-line with all the festival gear you may have been looking for or missed out on. Unique inside look into the life of a DJ/Producer with stories like Sneaker Pimp: The Secret Life of Umek. And this is just the tip of the iceberg. 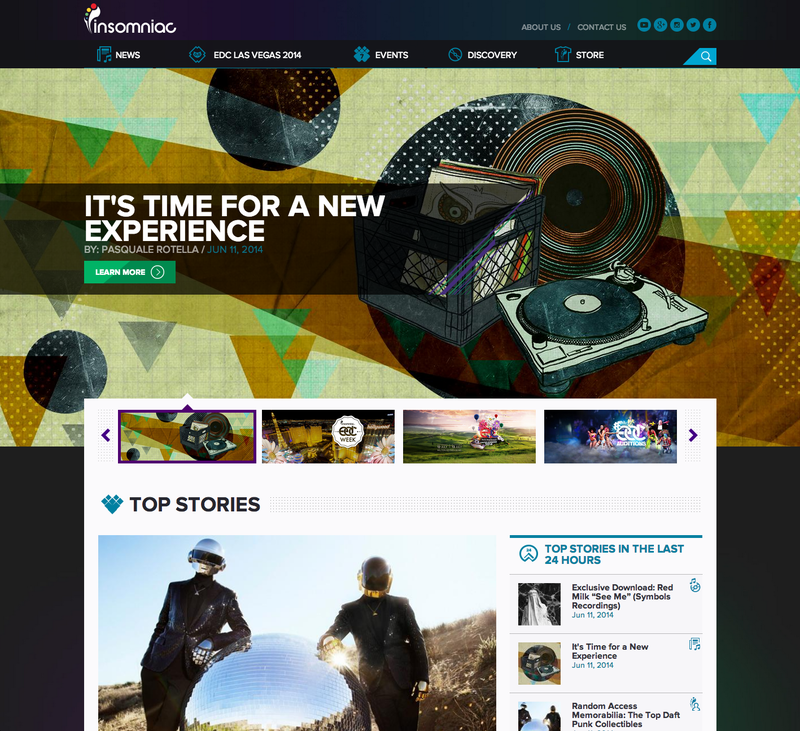 The new Insomniac.com deliver’s a complete online experience bringing the fans together outside of events with interviews, music, videos and EDM news all created for you, the Headliners. Check it out at www.insomniac.com.